Located a few blocks west of Commercial Drive in Vancouver's "East Van" neighbourhood. This is our "wet" studio and warehouse space. We recommend a bag lunch. Parking for the day is available in the Maiwa lot or on the street (where posted). Located on the second floor of the Net Loft Building, Granville Island. Bring a bag lunch or the Public Market is right next door. Parking regulations on Granville Island are strictly enforced. 3 hours free during the day and free after 7pm. $15 for the day. Located on Granville Island beside the Public Market. 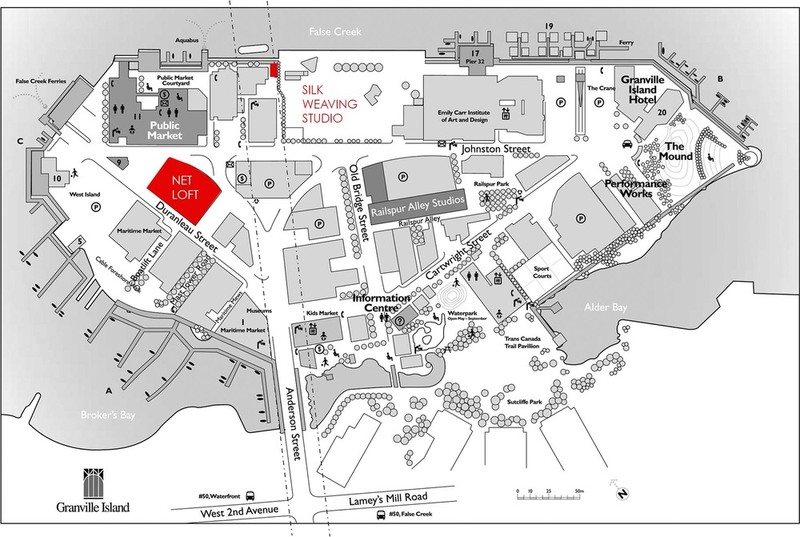 Lectures take place in the centre of the Net Loft Building, just outside the front door of the Main Maiwa Store. Located on Granville Island, under the bridge, beside the water, the Silk Weaving Studio hosts exhibitions and opening events.